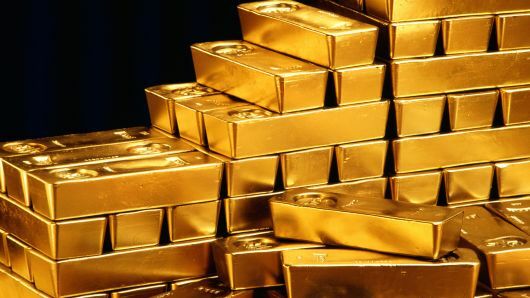 F ollowing huge gains, last Thursday, gold prices retreated on Friday as global stock markets rebounded after plunging sharply in the previous session and the dollar gained in strength. The dollar index was up by about 0.25 percent at 94.93 while gold futures for December ended down 0.5 percent at $1,222.00 an ounce. On Thursday, gold futures ended up $34.20, or 2.9 percent, at $1,227.60 an ounce, the highest settlement since August 1. For the week, gold futures gained about 1.4 percent. Sustained by upbeat exports data from China and on reports that the US Treasury Department, in an internal report, has not labeled China as a currency manipulator, markets in Asia and Europe surged higher on Friday. US stocks moved up as well, due largely to bargain hunting after two successive days of losses. The market’s upward movement was also aided by reports of a possible meeting between US and China presidents. Silver futures for December settled at $14.635 an ounce, gaining $0.029 for the session. Copper futures for December ended down $0.0025, at $2.8005 per pound. According to a report released by Customs Administration on Friday, China’s exports logged a double-digit growth in September to beat forecasts; despite escalating trade tensions with USExports grew 14.5 whether percent year-on-year in September, faster than the 9.8 percent increase seen in August and the expected increase of 8.8 percent. Imports advanced 14.3 percent annually compared to the forecast of 12.4 percent and August’s 19.9 percent rise. The trade surplus increased to around $32 billion in September, but below the forecast of $38 billion. Also, according to data released by the Labour Department, a much bigger than expected increase in US import prices in the month of September is indicated. The report said import prices climbed by 0.5 percent in September after falling by a revised 0.4 percent in August. Economists had expected import prices to rise by 0.2 percent. Meanwhile, the report said export prices came in unchanged in September after slipping by a revised 0.2% in August. Export prices had also been expected to increase by 0.2%. A separate report showed a modest decrease in consumer sentiment in the month of October. The report showed the consumer sentiment index dipped to 99.0 in October from the final September reading of 100.1. The drop surprised economists, who had expected the index to inch up to 100.4.